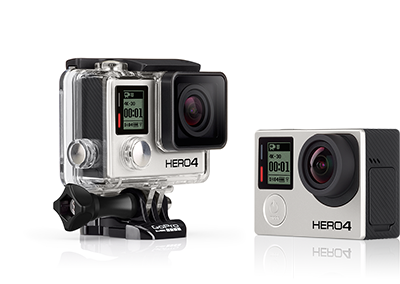 The new GoPro HERO4 comes in two different editions, Black and Silver. Here's a comprehensive guide to the specifications and features that each of the HERO4 cameras have. - SuperView™ mode offers maximum wide-angle perspective. - Auto Low Light mode automatically optimizes for low-light performance and changing light conditions. - 12MP photos bursting up to 30 frames per second. - New exposure settings allow up to 30 second exposures for dark scenes. - New HighLight Tag button and feature allows users to mark specific video times while recording. 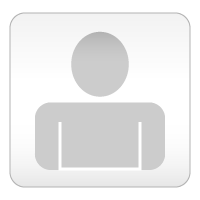 - QuikCapture mode allows users to turn on the camera and start recording with the touch of a single button. - New audio system delivers 2x the dynamic range. - Protune™ for photos and video offers advanced compression algorithms and control over Color, ISO Limit, White Balance, Sharpness and Exposure. 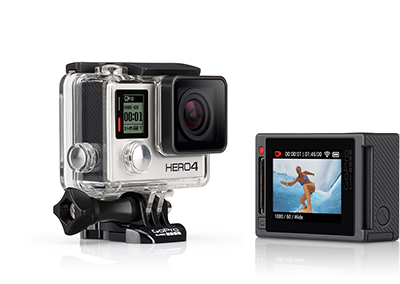 - GoPro App and GoPro Studio allow controlling the camera with a smartphone and create and edit video respectively. - First integrated touchscreen for any GoPro camera, allows video and photo preview and review, and improved menu navigation over front screen. - Protune™ for photos and video offers advangced compression algorithms and control over Color, ISO Limit, White Balance, Sharpness and Exposure. Personally I think the Silver edition makes a lot more sense for the majority of average "home video" users who are still looking for a high-end camera, especially since the LCD screen is exclusive to the Silver. The Black edition makes more sense for professional film production (and there are many reasons for this other than just the higher price point), and I think that's probably the market differentiation that GoPro is going for.